Daughter Quotes i.e. searching for some cute and funny daughter quotes. So if your answer is a yes, now you don't need to search for them anymore. 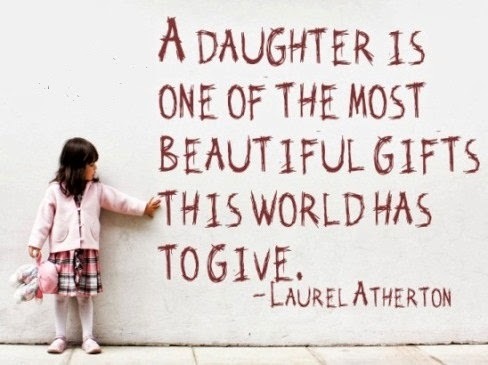 As here I have compiled down some of the cutest and funny quotes about daughters. Just hope you will like this quote compilation and able to find some cute words to explain your relationship with your daughter. A daughter is a treasure - and a cause of sleeplessness. A daughter is a miracle that never ceases to be miraculous... full of beauty and forever beautiful... loving and caring and truly amazing. Oh my son's my son till he gets him a wife, but my daughter's my daughter all her life. Many a man wishes he were strong enough to tear a telephone book in half - especially if he has a teenage daughter. What I wanted most for my daughter was that she be able to soar confidently in her own sky, whatever that may be. Daughter are angels sent from above to fill our heart with unending love. Certain is it that there is no kind of affection so purely angelic as of a father to a daughter. In love to our wives there is desire; to our sons, ambition; but to our daughters there is something which there are no words to express. If daughters couldn't soften a man, then nothing would. Our daughters are the most precious of our treasures, the dearest possessions of our homes and the objects of our most watchful love. We must teach our girls that if they speak their mind, they can create the world they want to see.